Don't forget to redeem your Free Finding Dory Snacks coupon this Friday! Click here for our original post. 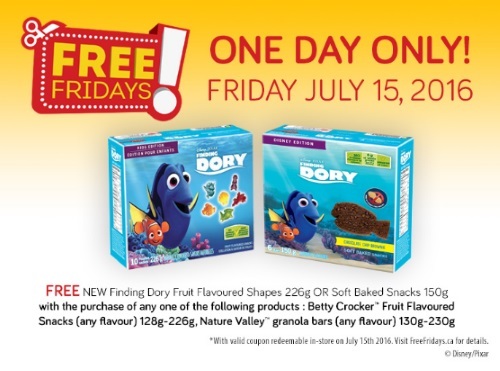 Get a Free Finding Dory Fruit Flavoured Shapes or Soft Baked Snacks when you purchase select Betty Crocker Fruit Flavoured Snacks or Nature Valley Granola Bars! This coupon is only redeemable this Friday, July 15, 2016. If you requested and got your coupon in the mail, get it ready to redeem in-store! Will you be redeeming your coupon? Let us know if you do on our Facebook Page here.